The KAI/Lockheed Martin F/A-50's test flight. Photo credit: Korea Aerospace Industries. 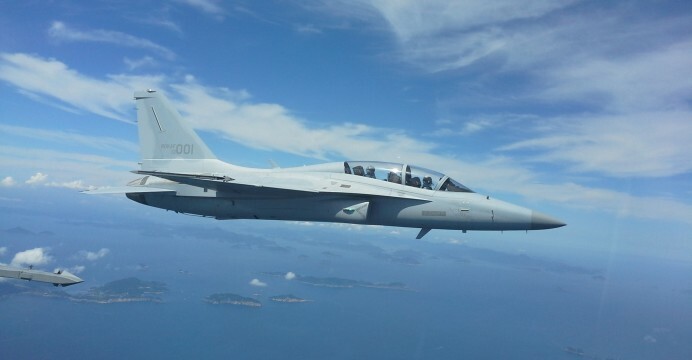 South Korea’s Korea Aerospace Industries (KAI) is pushing its FA-50 Golden Eagle to the Botswana Defence Force (BDF) as an alternate to the Saab JAS-39C/D Gripen. According to the Sunday Standard, KAI has tabled the FA-50’s “affordable acquisition and low operating cost” as marquee advantages over the Gripen. While sharing the same turbofan engine model (GE F404), KAI claims that the Gripen’s life-cycle cost is “three times” that of the FA-50. KAI is also promising a comprehensive training and support package for the Golden Eagle, one comprising of “instructional systems development” (ISD) for the FA-50 as well as its trainer variant the T-50 and the Pilatus PC-7 turboprop-powered basic trainer. Botswana had been in talks with Sweden for eight to twelve JAS-39C/D Gripen fighters in June 2016. The prospective deal’s value was pegged at $1.7 billion U.S. The BDF is seeking new fighters to phase-out its legacy Canadair CF-5, a Canadian license-built variant of the Northrop F-5E Tiger II. KAI is seeing increasing success with the Golden Eagle platform. KAI T-50 trainer customers include Iraq, Indonesia and Thailand, while the Philippines is the launch client of the FA-50 light fighter variant. While the FA-50’s ferry range and combat radius may not be as much as the JAS-39C/D, the FA-50’s radar, avionics and weapons suite are comparable to the Gripen C/D and other lightweight multi-role fighters, such as the JF-17 and Tejas. The Golden Eagle should imbue the BDF with the same air-to-air and air-to-surface munitions and capabilities as the Gripen. KAI is also pushing the idea of synergy between its near-identical FA-50 lightweight fighter and T-50 advanced trainer – by having the FA-50, the BDF can induct the T-50 with no additional strain to its maintenance and logistics overhead. On the other hand, Botswana neighbour South Africa also operates the JAS-39C/D. Acquiring the Gripen could enable Botswana to access South Africa’s maintenance, repair and overhaul (MRO) facilities, which may incur cost-savings over seeking those same services from Sweden.